Brenda Besse, who has been with the Illinois AgrAbilityprogram for 16 years and has been involved with the National Project, was selected this past month as Illinois "Outstanding Woman Farmer of theYear". 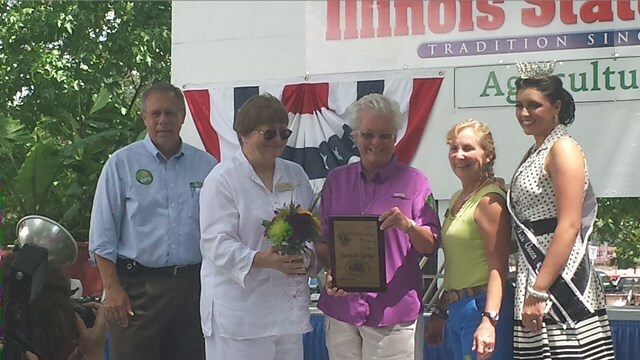 She was presented the award and honored duringthe annual Ag Day Luncheon at the Illinois State Fair on August 12. 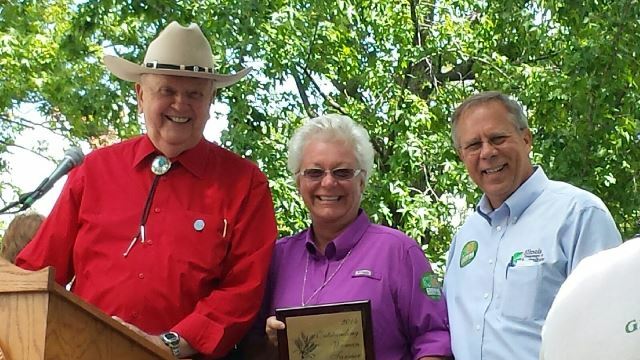 She was honored partly for her work with the Illinois AgrAbility program. Attached are two photos of the award ceremony. The photo of her receiving the award includes from left to right: Bob Flider, Illinois Department of Agriculture Director; Amy Bliefnick , Illinois State Fair Director; Brenda Besse; the fourth person is unidentified; and the 2014 Illinois Co unty Fair Queen. The second photo shows Brenda and national agriculturalbroadcaster Orion Smauelson ofWGN Radio, who was the MC of the awards ceremony. A copy of the award nomination for Brenda with further details on her career can be viewed by clicking here.